Archives of Eaton Bray News for August 2014. This article was published in August 2014. Please see Latest News for more recent information. 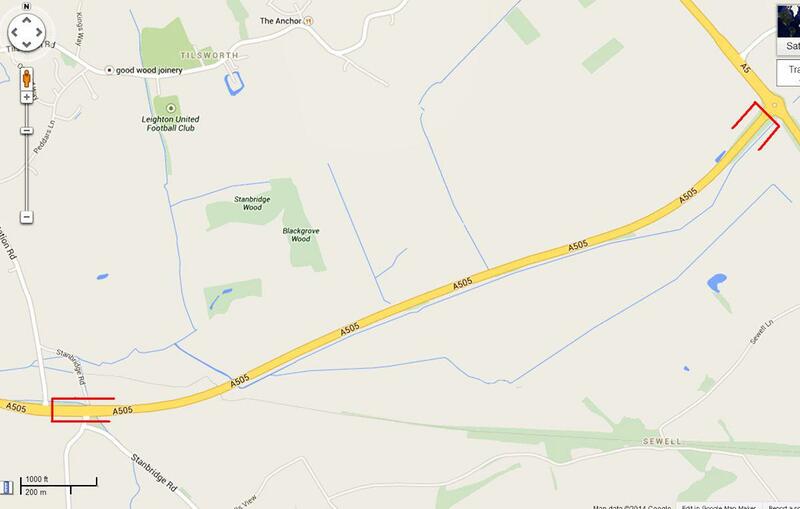 Central Bedfordshire Council have instructed Amey to carry out detailed design and programming for maintenance works at the A505 Leighton Buzzard bypass between the A5 roundabout and the Totternhoe / Stanbridge turns. The proposed dates are, from 06:00 Monday 22nd September until 06:00 Saturday 27th September. There will be a complete (24hr) closure during this period which will include the Totternhoe / Eaton Bray junction. The Stanbridge turn will remain open to Eastbound traffic. The dates provided are proposed dates and can be subject to change for a number of reasons. Advanced Warning signs will be erected at this location prior to work commencing. Line Dancing sessions begin again on Tuesday, 2nd September at 1.30 p.m. at Eaton Bray Village Hall. We will be starting gently with some easier dances suitable for new dancers and those of us who need a refresher after the Summer break. Line Dancing is excellent physical exercise, good for honing the memory and good fun (we don't take ourselves too seriously). The steps are set to a range of popular music styles, so there is something for everyone to enjoy. Please feel free to come along and try a free session. Classes cost £5.00 per week. We are a friendly group and you would be very welcome to join us. Artwork in any medium is welcomed from amateur artists young and old. There are three age groups: under 11s, 11-18, adults; and four categories: Painting, drawing, printing; Textiles; Photography; Sculpture, ceramics, glass and wood crafts. The deadline for entries is Friday 19th September 2014. It's easy to enter the competition. Attach an A4 high resolution photograph of your entry to an entry form. Entry forms are online www.chilternsaonb.org/free-art-competition or ring 01844 355525. Artists can submit up to three entries. There is no size restriction. Selected entries short-listed by local judges will be publicly exhibited at Arts4every1 in High Wycombe from 13 October - 14 November 2014. Prizes of £50, £75 or £100 vouchers to spend in local art and photography shops will be awarded to category winners. Incident Type: Theft from Vehicle. Location: Cantilupe Close, Eaton Bray. Date and Time: Between 7:00 p.m. on the 6th and 8:00 a.m. on the 7th August. Incident Details: The vehicle was a Grey, 11 registered, Vauxhall Corsa. The offender has smashed a side window, to release the bonnet. The bonnet, front bumper and headlights have been taken. This may be linked to a number of recent offences in the County, targeting Vauxhall vehicles, for body parts. Crime Reference: J D / 3 0 5 9 7 / 2014. Crime Reduction Advice: Park in well lit and public areas. If you have a garage please use it. Be aware of any suspicious activity around parked vehicles. Always check that it is correctly locked, and all valuables are removed, before leaving the vehicle. Alternatively you can contact the independent charity Crimestoppers, anonymously, on 0800 555 111, or online at www.crimestoppers-uk.org - No personal details are taken, information is not traced or recorded and you will not go to court. Eaton Bray Academy News Update! At the beginning of June, some of our Year 3, 4 and 5 children enjoyed a residential trip to Dell Farm, where they enjoyed taking part in archery, caving and survival skills. On the way we were pretending to be Robin Hood and Little John, it was funny! When we got to archery field, we were put in groups, and we gave our group a name. Conor told us how to use a bow. We had a little tournament and Alfie hit the bull's eye! My team was not happy with that because he was not in our team. Alfie's team won the tournament. Then Conor set us a challenge. He said the team that got the closest to the bull's eye wins and my team won. Someone nearly hit a sheep! Archery was great fun! The best part of Dell Farm was when we melted marshmallows and sandwiched them with the chocolate cookies! Yum! I loved sitting round the campfire. Eaton Bray Academy University Challenge! Forget 'The University Challenge' on the television, we have had our own version of The University Challenge in school! The children in years 3, 4 and 5 had to get into teams and played rounds against each other. Our team, 'People in Black' made it to the fi nals which were held in assembly in front of the whole school. It was nerve racking but we were excited. The questions were tough, they ranged from entertainment to Science. We persevered but unfortunately we lost to the Fantastic Three! We were all awarded with certifi cates and book vouchers. It was a great experience and we are looking forward to next year! Our first June Sunday service Melvin Corby reminded us that in the week of Ascension Day we are remembering the departure of Christ and the arrival of the indwelling spirit. He used the metaphor of the trapeze artist to emphasise that, like the leaping acrobat, we can do nothing to affect our own salvation but must trust implicitly in the strength and care of God who 'catches' us and saves us from falling. The following week, at our cafe worship we celebrated the birthday of the Church. Both children and adults were spell-bound as Steve Jones formed and lit a 'tissue' birthday cake that rose heavenwards as it burned; an analogy of the spiritual link between earth and heaven that was created at Pentecost. On Sunday June 15th we joined our friends in Edlesborough to give a warm welcome to a much-loved former minister, Nicola Jones. The packed congregation enjoyed a characteristically challenging sermon and heard about her work with Christian families in Palestine. A delicious buffet lunch was served after the service. Our monthly communion service was wellattended and led by Rev Nigel Wright who gave us a moving and thought-provoking sermon on forgiveness, an act we often find difficult to do ourselves but are constantly grateful that God does readily all the time. Date for your diary: Harvest Festival on 28th September. The service will be taken by Hyacinth Taylor. Packaged and tinned goods may be brought on the day to add to our harvest display. You are viewing the August 2014 archive.